This was one relatively, super funny, love at first sight story. Tara Malone is a mega-ultra coffee addict with a boss from hell. 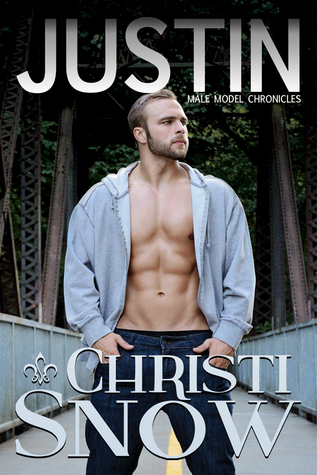 On a search for a nearby coffee shop she gets distracted from the road and accidentally hits male model Justin James. Male model Justin James is out for a jog when he gets hit by a car. When he opens his eyes, he thinks he's died and gone to heaven after laying eyes on Tara. With two broken wrist, both his arms are out of commission, so who better to help him than Tara. Tara has some serious image issues, which once you read about her mother, you'll get it; so, she can't believe that a super good looking guy like him can be interested in her. Justin is certain he's met the one; the entire story follows them forming a strong relationship. The story was short and entertaining; what made it even more entertaining was that these fictional stories are inspired by real male models. There are two more books in this series and I can't wait to see what Ms. Snow does with them.